Flawless Service from Fromage Gourmet Market & Bistro for Restaurant Week’s Delectable Category! Suga had a fabulous date with husband, Randy Burgess last Saturday night. Reservations were for 7pm at Fromage Gourmet Market & Bistro on Hillcrest Avenue and we were on time. This Fromage was listed under the Delectable Category ($3800JMD) for Restaurant Week (RW). So dinner with a beverage including 5% service charge and tax can run you up to $5500JMD for one person. We chose an early time for dinner, when the newly refurbished and slightly more spacious Fromage would not have been filled to capacity as yet. It reached full capacity midway through dinner though. The Staff were courteous and extremely attentive without being overwhelming. All members of Staff were on the floor, paying attention to the tables whether they were serving that table or not. A sign of well-trained staff. Our server was Dimel, who I am familiar with. Always a pleasure. Food came out like clockwork and water glasses were topped up when necessary. Great service. I had the Bacon wrapped maple smoked Prawns and Randy had the Marlin Corn Fritter Stack. I always enjoy Fromage’s house-made Pepper Jelly that has that divine mix of spicy and sweet as the name suggests. As we wrapped up with the Appetizers, JPS had a promotion going on throughout the night for RW diners to download their JPS App and drop their card with contact information into a bag. They came during dinner service to do the first raffle draw for the night. Suga a.k.a Gabby from Suga Lifestyle was the first lucky winner at Fromage Gourmet Market & Bistro for downloading the ‘My JPS’ App! Our Main dishes came out shortly after the excitement of shaving $5000JMD off of our next Light bill. My BBQ Ribs pleased my taste buds as described. They were lean, juicy, well seasoned and slow-cooked to a tender perfection. Randy’s Steak Au Poivre was cooked to order. It was so succulent. Bravo Chef! Medium rare Steak cooked to order! Without a doubt, dinner came to a close for me with their popular Caramel Bread Pudding. It was warm and scrumptious as usual with their salivating caramel crumble on top. Randy thoroughly enjoyed his Bailey’s Ice Cream Sundae. Fromage Gourmet Market & Bistro is Suga Endorsed for Restaurant Week. Pay them a visit if you can and continue to enjoy. Stay tuned for Terra Nova’s review for the Epicurean Category! 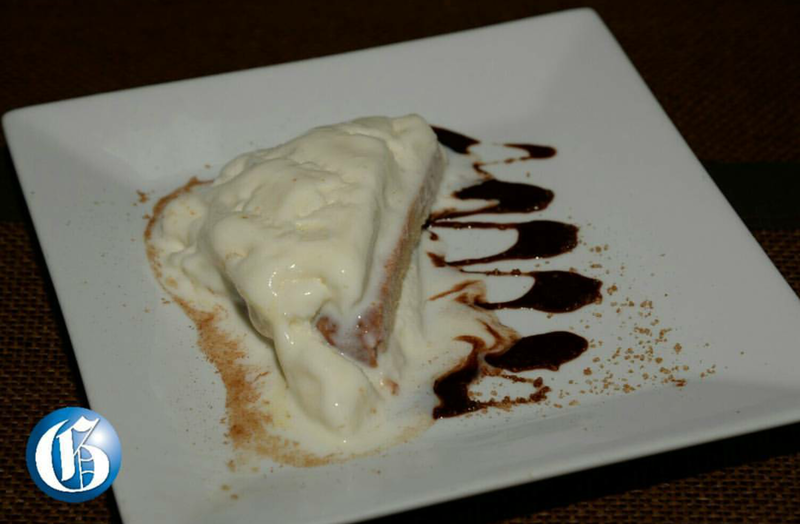 The Other JFDF Events and Suga’s Epicurean & Delectable Choices for Restaurant Week! Suga brought you the low down for Crisp at The Gardens, Jamaica Pegasus ($5000 All Inclusive) and Picante ($7500 All Inclusive) at The Ruins, UWI Mona’s Visitor’s Lodge, so how were the other JFDF events? Suga Bears and Suga Daddies reported! Most persons like to get bad news out of the way first. The events with the highest price tags were not that impressive for some patrons. That is, Vintage for $12000JMD all-inclusive and Brunch at the Gallery for $20000JMD/$150USD all-inclusive. Meals at Vintage at the Manor in Jack’s Hill were described as basic and a low standard for Ortanique on the Mile, one of the restaurants in Florida that was represented by Owner Cynthia Hutson. Suga Bears enjoyed the view and Dessert though. Brunch at the National Gallery, Downtown Kingston presented by Suzanne and Michelle Rousseau was decorated beautifully by Tai Flora and had a sufficient selection of Wines by Select Brands, but the service of food was slow and it arrived to tables cold. The Brunch was from 11am to 4pm and after a long day, patrons were leaving at 4pm and Dessert was just being served. Should the blame go on the Event Planner, the Chefs or both? It was stated that the execution was poor. The Presentation of some of the meals were also quite sloppy to say the least. Did the Incredible Hulk have an accident here?! I was in disbelief and gathered that this was the consensus amongst most tables. This looked nothing like the neatly displayed dish on the Event’s social media page. Cold food, slow service and poor, unappetizing presentation is unacceptable for $20,000JMD. I believe things can be shaken up next year. There are so many other talented, efficient Chefs around and I understand the ambience of The National Gallery, but a change in venue could be considered as well. Kudus to award-winning baker, Nadine Burie that probably saved both events. Her desserts are offered at Cafe Blue. Setting bad news aside, persons fully enjoyed Meet Street and the Market in Downtown, Kingston ($500JMD entry) last Saturday. A patron said she did not know that Downtown could be so nice. The set up and atmosphere was phenomenal and the vendors outdid themselves. Pork Palooza ($6500JMD All Inclusive) at Palm Drive, Hope Gardens that kicked things off for the festival on the Saturday the week before was a hit. The event is usually the favourite for Patrons. Jamaicans love their Pork! It wasn’t the unanimous favourite this year though. Which event took JFDF 2017?! Close call! It has been narrowed down to the new event, Chop Stix ($5000JMD All Inclusive) held at Zen Lawn, Hope Zoo last Wednesday that featured fare from the far East and the zesty, Picante! Based on Food, Weather and Vibe, Chop Stix gets the edge. Picante had the on and off rain, which was uncontrollable with provisions put in place, but Jamaicans love a new event. The Chefs, Caterers and Restaurants delivered at Chop Stix! Here was the Menu if you missed it. Chop Stix can’t be missed next year! So what’s next for my Foodies? Restaurant Week! Yes, I know Restaurant Week has lost its steam. Marketing has been ongoing but should be revised, including the selection of Ambassadors. JFDF being so close to Restaurant Week definitely overshadowed it. Menus for Restaurants are more of the same, but it makes your choices that much easier. The good ones will pop out at you. So that means you may need to make reservations quickly or maybe not, because places I called yesterday that are normally booked out weeks in advance seemed to have quite a bit of space left. For now, I am leaving you with my recommendations for the Epicurean and Delectable Categories. Here you go! > The Terra Nova All Suite Hotel in Kingston. Despite inconsistencies in service and quality throughout the year, they have managed to keep a good reputation for Restaurant Week so far. Sidenote: I do not think any Restaurant in Market Place should be placed in the Epicurean Category. The venue is far too casual and a long wait is usually expected. Out of town? Marguerites by the Sea, Montego Bay. You should expect a spectacular dinner and service with a seaside or picturesque garden view. There are some other reputable Restaurants listed, but the lack of creativity with their Menus were the deal breakers. > Fromage Bistro on Hillcrest Avenue in Kingston. 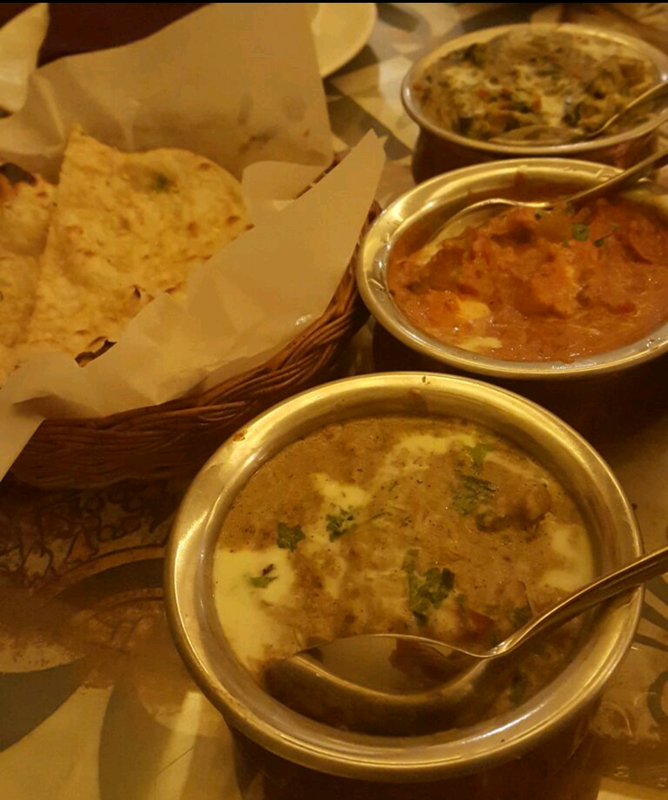 Nirvanna Indian Cuisine, Centro-Courtyard by the Marriott and Black Orchid Restaurant at Eden Gardens would be secondary choices. In the other city? 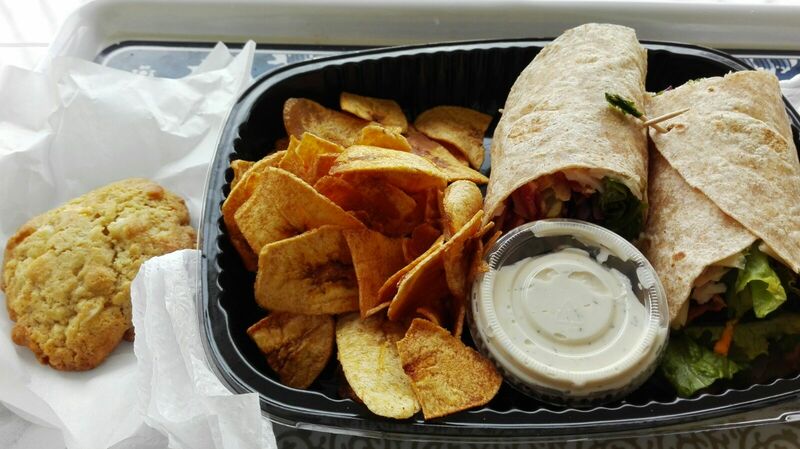 Both options from Mobay are primary choices – Mystic Thai and The Houseboat Grill. So persons can choose between the two based on the Cuisine desired. 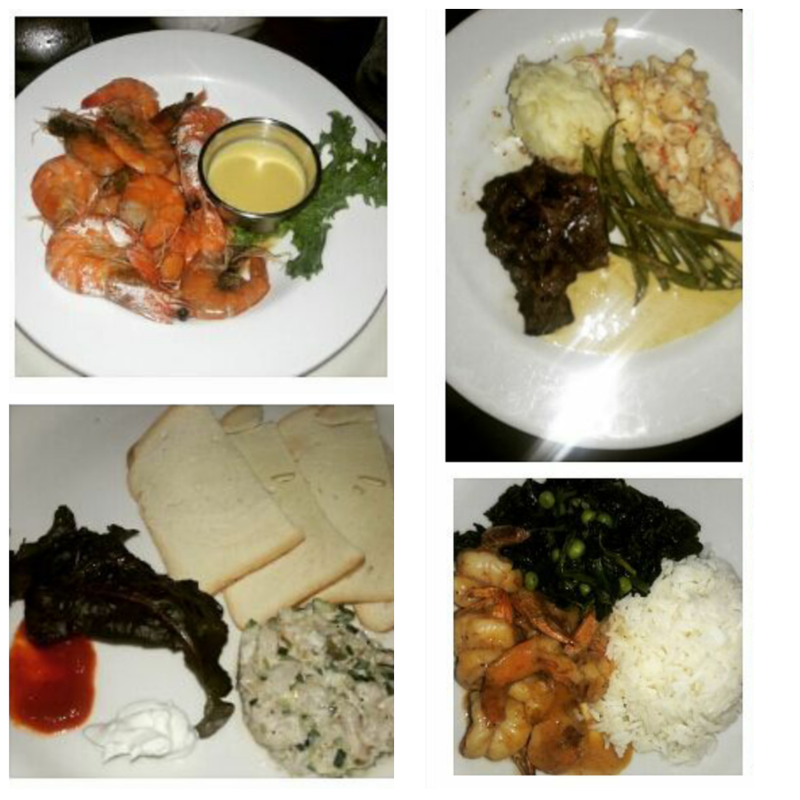 How was Restaurant Week for Suga and her Suga Bears? Not so exciting. The majority of Suga Bears’ responses were ‘meh’, ‘It wasn’t all that’ and ‘I didn’t participate this year or feel the urge to’. I totally agree. Marketing was probably at its lowest this year. It seemed as if the Ambassadors were practically invisible until the week had almost passed by. The Nyam & Jam Food and Drink Festival had a lot more buzz going on. Did the US elections and the victory of Donald Trump kill advertising? It’s partially the media’s event so they should have had control over that. The lack of creativity and variety in Menus were also disappointing for many this year, causing some not to participate at all. Though in agreement, I still tried to find and suggest the best Restaurants and got a few to change their mind. 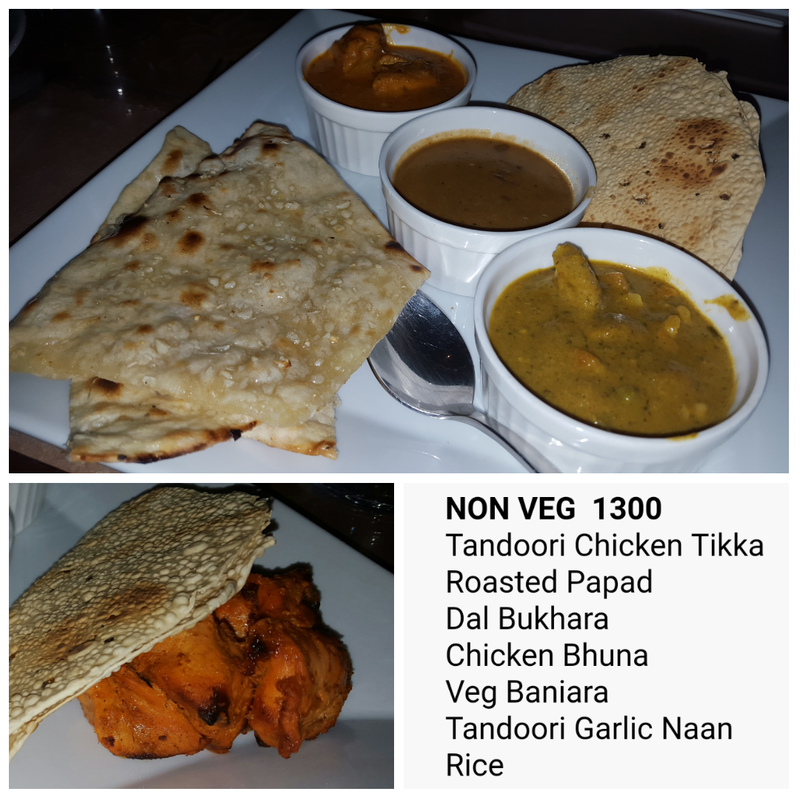 One was pleasantly surprised with Nirvanna Indian Fusion Cuisine’s Nyam and Scram. It was not only affordable but filling and delicious with the right amount of spice. Suga can’t say the same for CPJ Deli’s Nyam & Scram though. Thankfully I made the right choice with the Pan Seared Snapper Fillet. It was the best of the worse at the table with its bones and all. The Grilled Garlic and Ginger Pork Chop was lacking seasoning and a salivating sauce and the Crispy Parmesan Shrimp Salad was a disaster. The best thing on that plate was the taco shell that the Salad came in. The Salad arrived at the table with no vinaigrette as advertised and the Shrimps were burnt. When my friend was already trying her best to get halfway through, the waitress realised she forgot to serve it with the vinaigrette and Parmesan cheese for the Shrimp. The Parmesan cheese could not help that dry, burnt Shrimp though. Most of the staff were unpleasant and seemed overwhelmed by the Deli full of diners. They usually have good service but last Saturday was horrible. Even getting an extra fork was a production. Their Restaurant Week menu did not include a Soup or even a Muffin but only a glass of wine or a Vodka mix along with the meal. Thankfully we digressed from the Restaurant Week menu and ordered the Chocolate Endulgence. Go to CPJ Deli if you are in need of a proper Chocolate fix! Let it soften from the fridge for a bit and then allow it take your breath away. Endulge! Cannonball Café was a good Nyam & Scram pick as I had suggested. They really were all that and a bag of chips. The Houseboat Grill (Delectable) in Montego Bay was average and the food was described as salty. Have they fallen off? That would be a shame. Suga will have to revisit and see for herself. 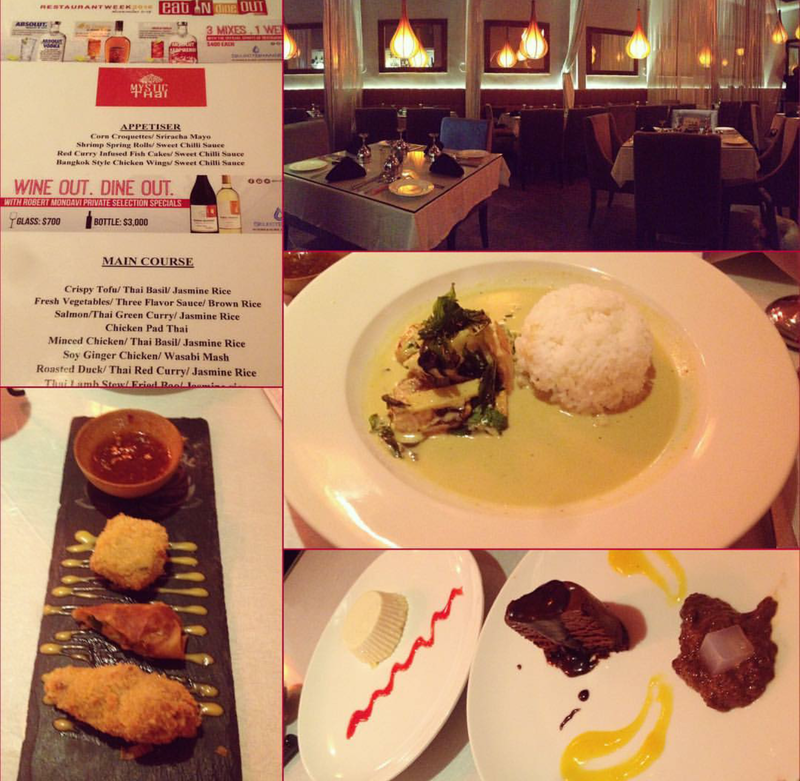 Mystic Thai (Delectable) in Montego Bay had good feedback. It was said that their ambiance and service were great as usual. They offered 1 of each Appetizer. My Suga Bear was not a fan of the Wings Appetizer and found the Salmon to be satisfactory, but enjoyed the Minced Chicken Entrée and Chocolate Mousse. 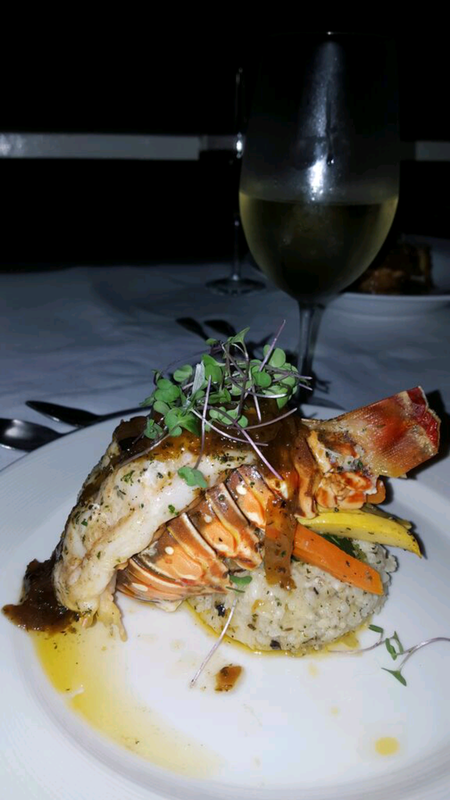 Marguerites Seafood by the Sea in Montego Bay (Epicurean) has kept up its sensational standards. 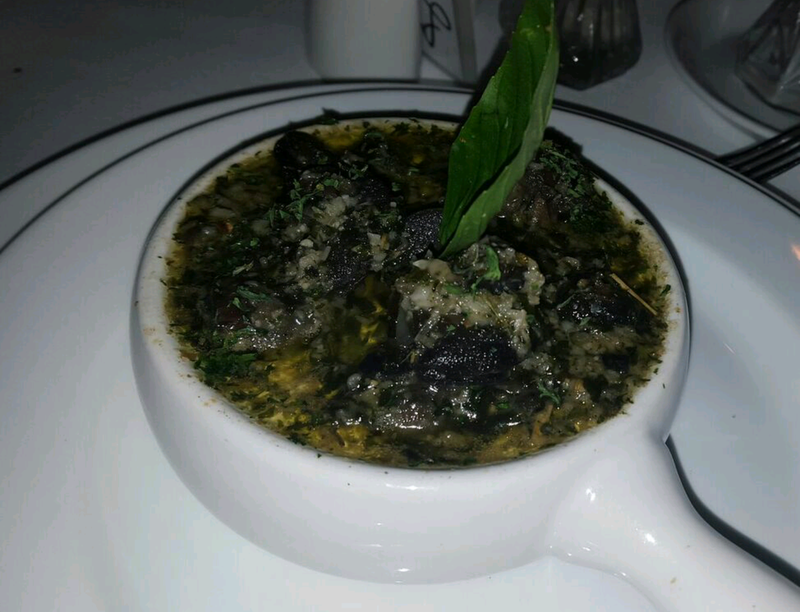 I was let down by the build up for L’Escargot (Epicurean). Thankfully the best thing was their Escargots. Long waits, tasty but not so delicious food, desserts that were not decadent and waiters that lacked charisma. Not value for money but will revisit as they have an extensive menu. 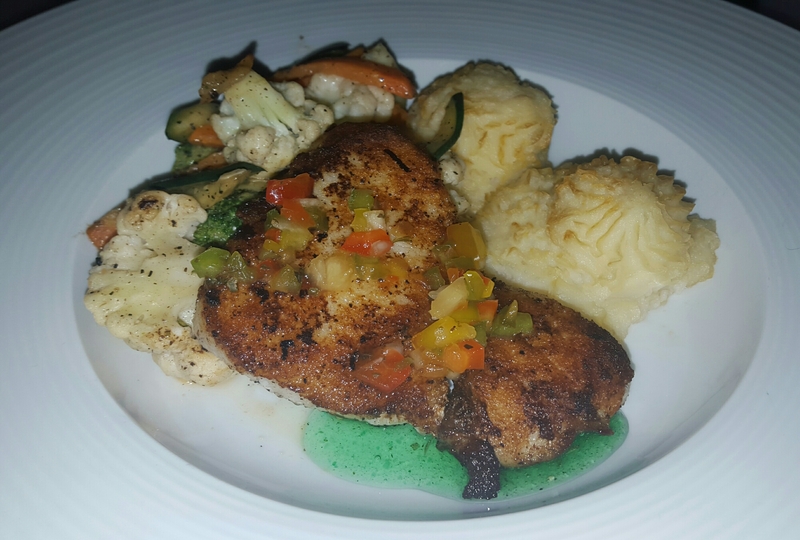 I was disapponted that I did not get to try Boardwalk Bistro, Ocho Rios (Tasty) for Restaurant Week. They took a while to greet me as a diner and did not start serving the RW menu until 5:30pm. Since it was literally on the Boardwalk close to the sea and given the casual look of the Restaurant & Bar, I think it would have been appropriate to offer their menu during lunch time was well. The tourists on their Cruise may have also enjoyed that option. Sadly I will have wait to return some day to taste their Rum Fire Ice Cream Cake (if available) that I was looking forward to, as well as one of their best sellers, the Fisherman Seafood dish with scallops, shrimp, squid, mussels and fish. Great Escape at Runaway Bay Golf Club (Savoury) was a pleasant surprise. New kids on the block with great service and food with a picturesque view. 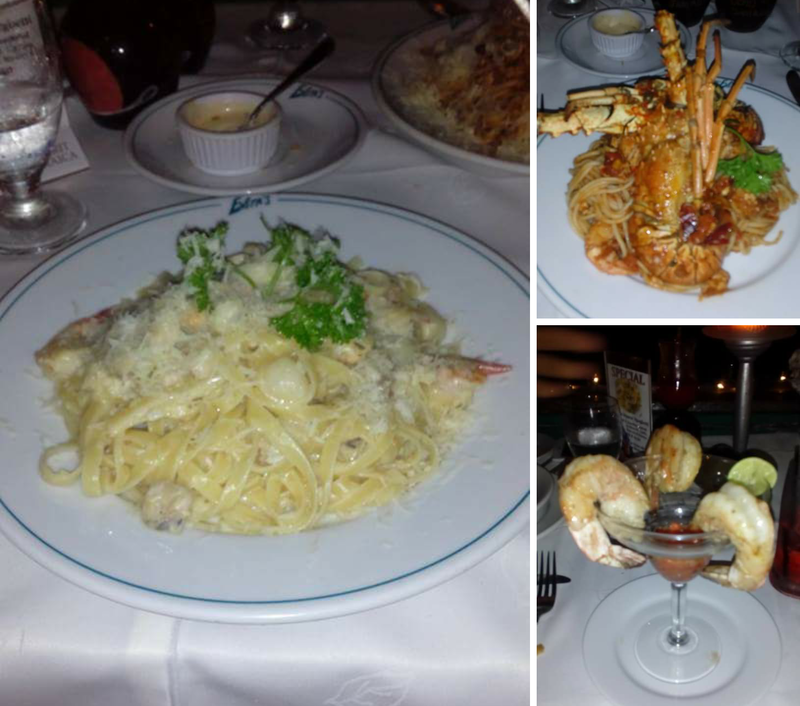 Evita’s Italian (Delectable) also held it down in Ocho Rios. Kudos to them. They had another good year. In Kingston, it was reported that Redbones (Delectable) was good but not great. I think they are consistently good but didn’t see based on their menu where they would be spectacular. Saffron Indian Cuisine (Savoury) was not prepared for Restaurant week. A Suga Bear had an 8:00pm reservation with friends and got seated at 8:50pm at a two seater table for three people. What a shame. The Regency Room at Terra Nova All Suite Hotel (Epicurean) lived up to its reputation of having the best Lamb Chops! Many Restaurants may not have been mentioned but these are the highlights for Suga this year based on experiences and feedback given. If you did not choose to participate in Restaurant Week this year, still have a look at the Restaurants at http://www.go-jamaica.com/rw/ and see where looks interesting that you haven’t visited as yet. Let us remember Restaurants not only treat diners with special offers for Restaurant Week but participate for opportunities to expand their patronage and debut new items on their Menus. I look forward to trying Bettino by Drax Hall Estate, Ocho Rios and Smoked Marlin in Hanover some day soon. Well that’s it for this year folks. Until next year! Where to Reserve your Tables for RW’s Delectable Category! Suga could not select a clear #1 choice for RW’s Delectable Category ($3800JMD excl. Bar, GCT, Service charge) this year because of the difference in Cuisines. 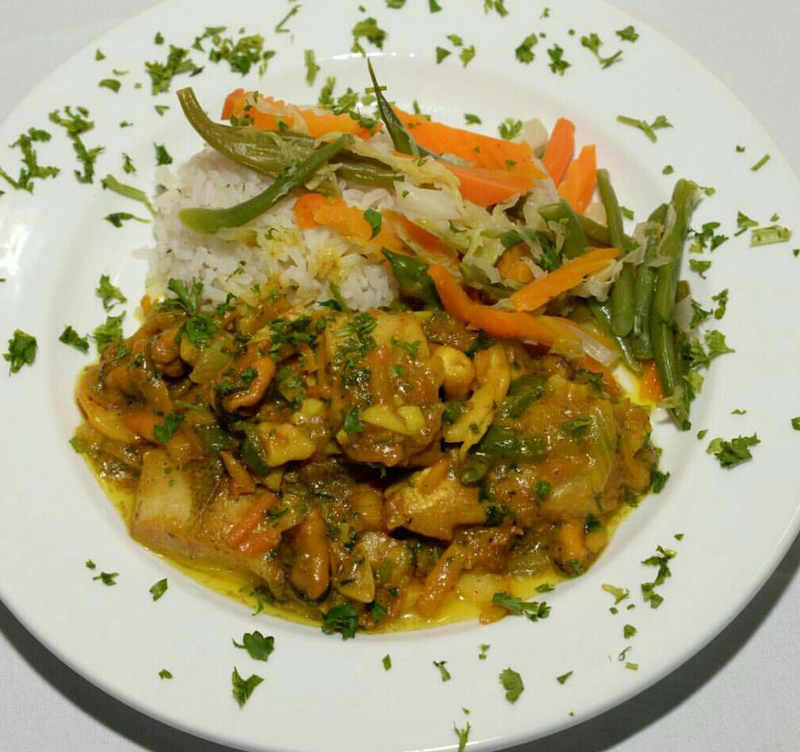 So Suga’s Top 2 picks are the relatively new kid on the block, Nirvanna Indian Fusion Cuisine in Kingston and the always outstanding, Houseboat Grill in Montego Bay based on their menus and in turn value for money, ambience, décor and service. The Surf and Turf from The Houseboat Grill should be to die for! Remember that the Delectable and Epicurean categories are excellent considerations for Date nights or to dress up and go out with Friends and Family. Shampoo! Dinner from Nirvanna last December 2015! For Kingston, the runner-up choice for me is Redbones Blues Café. They do a lovely Lobster Pasta. I expect more of the same from Majestic and Whitebones so did not consider them. The Restaurants listed under Kingston should be revised for this Category. The runner-up for Montego Bay is the new, Mystic Thai. I think they could do better with their menu based on what they are capable of offering though. 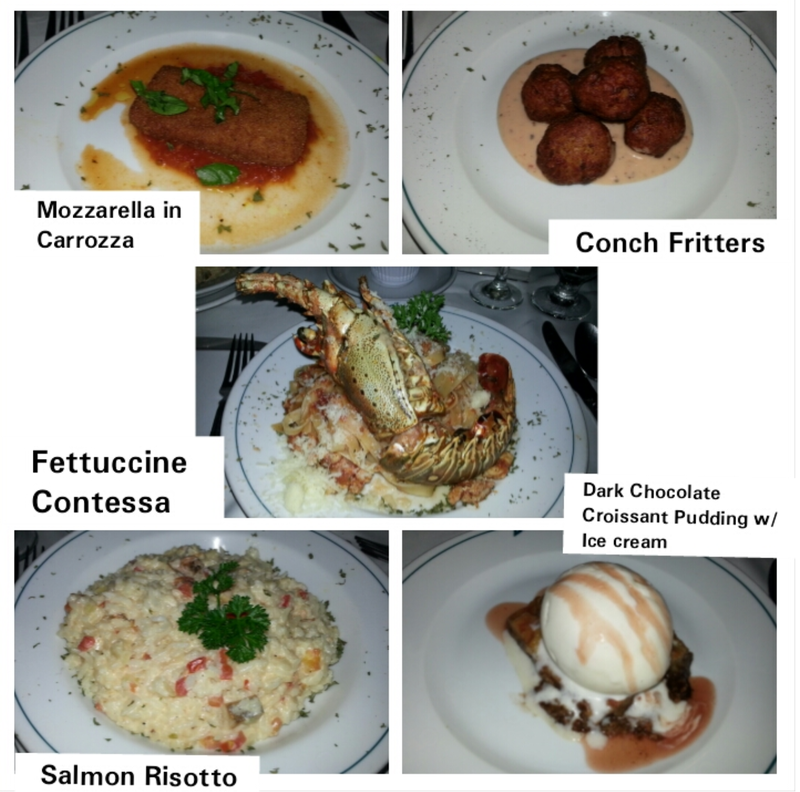 For Ocho Rios, I gave Evita’s Italian Restaurant the edge over Christopher’s at Hermosa Cove for those that haven’t visited Evita’s in years. Both have good service and food but Christopher’s has the better view if seated outside. So Christopher’s is known for delicious, authentic food with a seaside view but even though the menu for Evita’s seems more of the same, their Linguine ‘Contessa’ Fettuccine was one of my most memorable and favourite RW dishes to date. 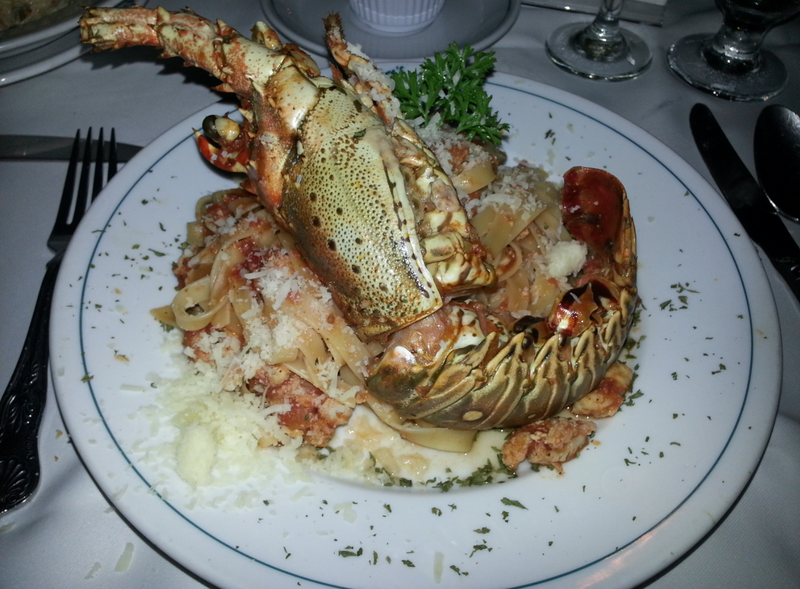 Whole Lobster in the shell tossed with Baby Shrimp and Lobster meat! The Salmon Risotto was lovely as well. 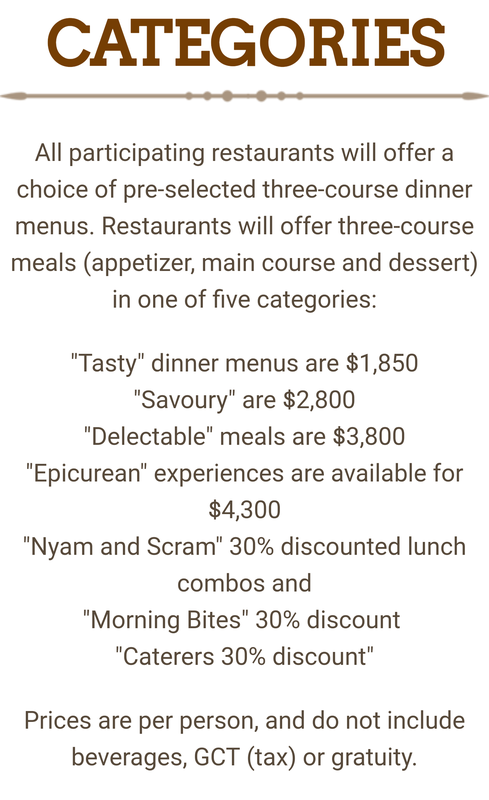 Restaurant Week Jamaica 2016 is almost here! Jamaica Food and Drink Festival has come and gone. Brunch at The Gallery was quite memorable for patrons yesterday. Now on to the next! Restaurant Week Jamaica starts Friday, November 11 and ends Saturday, November 19, 2016. Here are your categories. Suga’s picks coming soon!